Consider a parallel plate capacitor, with no dielectric material, attached to a battery with a fixed voltage. 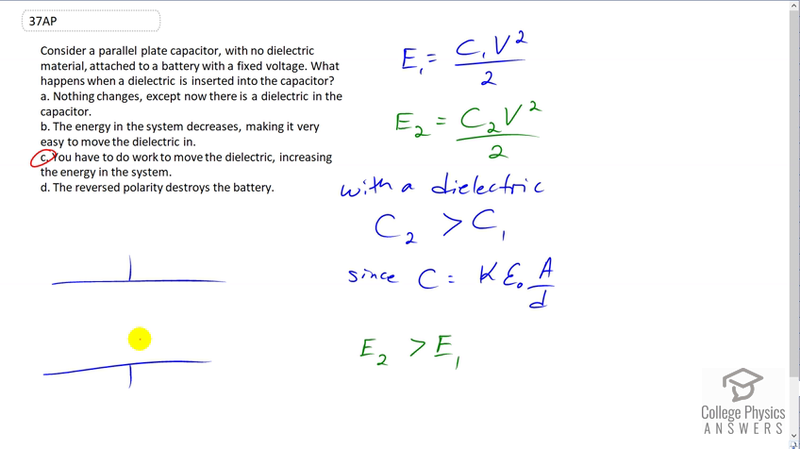 What happens when a dielectric is inserted into the capacitor? Nothing changes, except now there is a dielectric in the capacitor. The energy in the system decreases, making it very easy to move the dielectric in. You have to do work to move the dielectric, increasing the energy in the system. The reversed polarity destroys the battery. This is College Physics Answers with Shaun Dychko. We have a parallel plate capacitor with no dielectric material between the plates. We have assume a vacuum or air which is almost the same dielectric constance as a vacuum. And, it's attached to a battery with a fixed voltage. And, the question is: What happens when you put a dielectric in there? You just slip it in. Well, the energy in the capacitor is, in the first case, before the dielectric is put there, is the first capacitance times the voltage squared over two. And in the second case, after the dielectric is put in, it's the capacitance two time the same voltage squared divided by two. Now, with the dielectric material, the capacitance is going to be this dielectric constant, which is always something greater than one, multiplied by Epsilon naught A over D. And, in the first case, C one, the dielectric constant is one. And for C two, it's going to be some number bigger than one. And so, C two is going to be greater than C one, which will mean that E two is greater than E one. So, the capacitor will store more energy after the dielectric is put in between the plates. So, that energy has to come from somewhere. And so, it must mean that you have to do work to move the dielectric in there, thereby increasing the energy of the system.